all are free ………………read on. These are wonderful thank you!! As usual your suggestions are "top notch!" Thanks.. 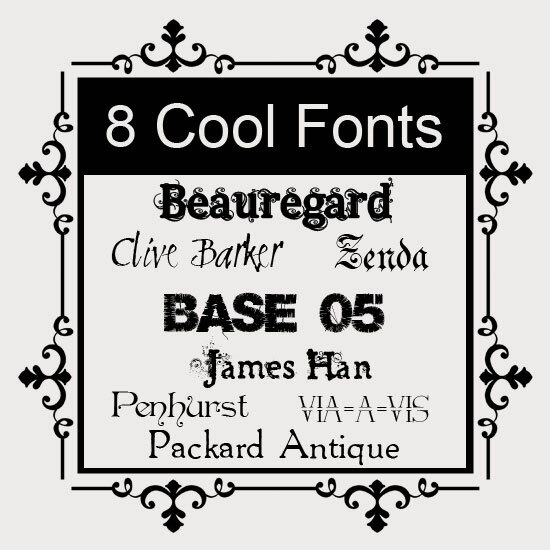 I too am a font collector..
Great finds! I think I just might dip my pen nib into a couple of these. Thanks. Very nice batch of fonts. Especially like "Clive Barker." Thank you. Thanks so much for sharing these, Jerry. Loved all of them. I really love the Beauregard but it only has the lower case. Is there an upper case version available? You are very generous in sharing all your work with us. Thanks so much. You could go away for a month and find us all here when you get back... always thankful for what you share. Your generosity of your wonderful talent, may it be returned to you one thousand fold!